Tao's Acupuncture & Herbs center located in Allentown, PA. I am Chung-Hu, Tao, a licensed and certified acupuncturist at the Tao's Acupuncture & Herbs Center in Allentown, Pennsylvania. I have practiced acupuncture and Chinese herbal Medicine In since 1985, and in Allentown, PA since Feb.,1995. I hold a Master's degree from Samra University of Oriental Medicine in Los Angeles. I am a licensed acupuncturist in Pennsylvania, and I am also licensed in New York and California - the highest professional standard in U.S. In addition, I am a Board certified diplomat in Chinese herbs by the National Commission for the Certification of Acupuncturists (NCCA). a two year TCM apprenticeship in Taipei, and then completed the Master's degree program at Samra University of Oriental Medicine in Los Angeles. After graduating in 1994, I completed a one year continuous educational program related to orthopedics. I then moved to Allentown, PA. and have been practicing TCM ever since. In addition, I also studied anatomy, physiology, and biomedicine at East Stroudsburg University and completed additional clinical training at the TCM hospitals in Beijing, Shanghai and Gualin. In my own experiences, I have found acupuncture combined with Chinese herbs to be very helpful in treating chronic pain, gastro-intestinal disorders, female diseases, allergies, skin diseases, mental illness, drug & alcohol withdrawal, and chronic fatigue, as well as those who wish to lose weight or stop smoking. Additionally, acupuncture can serve as a supplemental treatment and may help patients who experience G-I upset from medication, no improvement or relief from medication; or limited help from cortisone injections, physical therapy, or spinal adjustments. In 1997, the National Institute of Health (NIH) endorsed acupuncture as treatment for nausea, vomiting, addiction, and chronic pain. While conceding that additional research is needed to categorically prove acupuncture's effectiveness in treating other diseases, the NIH supports acupuncture's therapeutic value and has urged physicians to be open-minded about recommending it to their patients. Based on this research, I urge patients and primary care physicians, neurologists, orthopedic doctors, pain specialists, rheumatologists, physiatrists, physical therapists and chiropractors to be open minded regarding acupuncture and TCM treatments. Surgery should always be the last option. 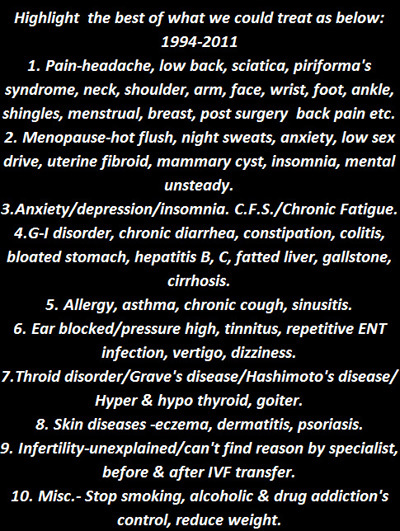 This applies to chronically painful conditions like carpal tunnel syndrome, trigger finger, mild or moderate disc bulging or herniated disc, spinal stenosis, and chronic Illnesses like hysterectomy for uterine fibroid, mammary cyst, ovary cyst, endometriosis, small gallstones, pancreatitis, colitis, sinus, etc. Acupuncture with herbal therapy has been an effective, risk free treatment of the aforementioned conditions. I adhere to strict sanitary standards and use only disposable needles in my practice. If you have a fear of needles, I can use alternative approaches to achieve results similar to acupuncture. I can use ear seeds to stick on the acupuncture points in the surface of your ears, magnetic needle techniques, cupping, orally taken Chinese herbs, and external patches to achieve a somewhat similar result if the patient has an initial fear of acupuncture needles. Regarding insurance, currently worker's compensation and auto injury cases are typically covered. The health insurance coverage now is new opened to the High Mark PPO blue-Federal Employee Program 100% covered, Cigna Healthcare PPO-for Cathy Airliner Employee 100% covered, Blue Cross Blue Shield PPO, Indemnity plan 80% covered, in United Healthcare or Aetna-Choice Plus-80%covered (x may) cover also. If you have a different insurance plan, or are unsure whether your plan cover or not, please dial the phone number in the back of your insurance card for member service to check whether your benefits cover or not. If covered, then the deductible amount for non-participated provider with allowed visits etc. information, also important for your reference. If you need us help, please provide your insurance card information with the date of your birth, we could find for you. For your first appointment, please bring any reports or information that could help me to understand your physical condition and develop a treatment plan. This could be a radiologist's report, lab test's report, specialist written report, or any other reports if available. Under current PA acupuncture law, a written diagnosis from your medical doctor is necessary if you will receive our treatment over 60 days from the first day of your visit. 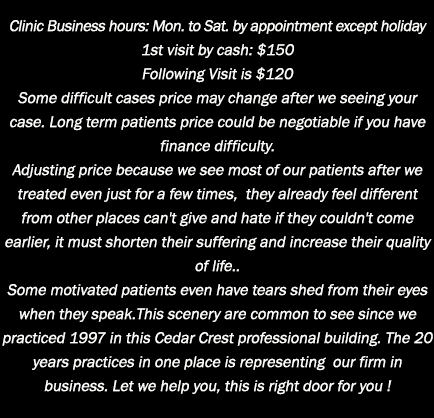 Meanwhile, I encourage you to open "Testimonials" link below, in which our patients share their true stories and experiences about the effective treatment they received at my practice. In addition, the "Specialties" link contains in-depth information regarding some of my specialties, treatment of specific diseases, and commentary. Finally, I would like to quote the words of Deng Xiao-Ping, the past Chairman of China: "No matter you are the white or black cat, who can catch the mouse is the good cat." The meaning behind the statement is when comparing Western and Eastern medicine, the issue is not whether you are an M.D. 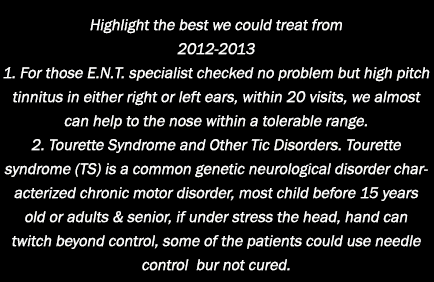 or a practitioner of TCM; what matters is how much you can help the patients. The best doctor is the one who can help patients the most. Based on Deng's practical thought, I'd like to invite you to try acupuncture and TCM if you are not satisfied with your current treatment. Thank you for visiting this website. Please contact me with any concerns or questions or to schedule an appointment by phone. Chung-Hu Tao/ L.Ac. & L. OM. This is our clinic picture down inside a medical building since 1996. Joined with American acupuncturist to the "People to People ambassador Programs" to the P.R. China. Photo with department head of acupuncture division in Guilin TCM Hospital. In front of International Education College, Shanghai TCM University. The modern building of Guan An Men Hospital in Beijing. It has 24 clinical departments, 13 warts with 505 beds in the impatient dept.,the daily outpatient visits over 2,000. With Dr. Sun, department head of acupuncture division in Long Hwa Hospital in Shanghai. More and more Americans are more like to try acupuncture when traditional treatments failed. The needle is sense no pain or feel little pain compare to traditional needle, This small pain really nothing.. The effect of treating pain just like your take medicine or receive shots. But there is no upset your stomach or the terrible pain when you received epidural shots. The patient Julie who is a nurse working for a nursing home, injured from her work thru help a heavy patient falling down. Her left shoulder blade and lower scapula area with her shoulder joint got injury with a lot of feel pain influence her job when she need withdraw sheet of protection. She tried all the current medical help, cannot relived her pain, she only could tale disable from social security. After the patient treated by us, just a few weeks, she could back to a original life and restore her full time. Look her smile with child, this help not only good for her whole family also good for our society and country. Chung-Hu Tao, LAC.& L. OM. This site is maintained by Ethnicom Group, Inc.